Anyone who loves their car wants to keep it clean and shiny, but hot water and suds can only do so much. That’s where Autoglym comes in, with their expansive line of specialised car cleaning products. So, whether you want to bring back the lustre of your paint job, return sparkle to your hubcaps, or rescue your roof after an afternoon parked beneath a bird’s nest – Autoglym has a product that can help. Autoglym’s selection of bodywork products, wheel cleaning products, and detailing cleaners can put the shine back into your dim and dingy car. Autoglym’s Bodywork Shampoo and Shampoo Conditioner both employ a pH-neutral formula designed to be gentle on your paintwork. However, while the Shampoo develops a rich foam to break down contaminants, the Shampoo Conditioner is low-foaming to encourage rinse water to sheet of the surface. This ideal if you have already applied polish or wax and want to preserve the shine. 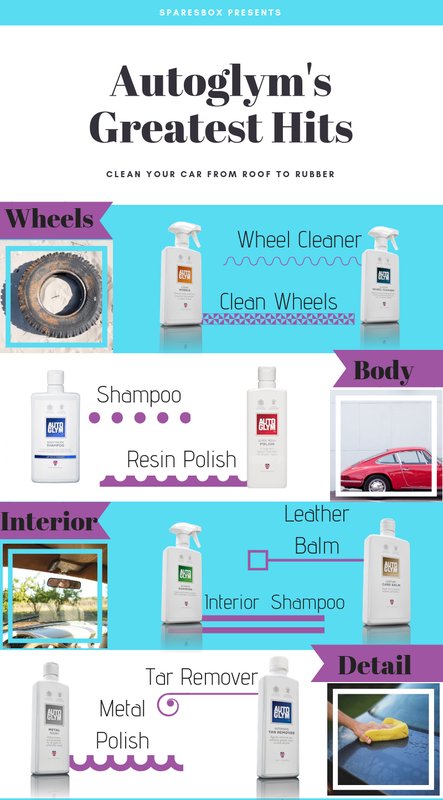 Put those little touches on your car with a range of detailing products. Autoglym offer everything from Metal Polish and Tar Remover to their innovative Paint Renovator, carefully formulated to help remove scratches and scuffs while improving the appearance of oxidized or faded paintwork. Once you’ve got your car sparkling, it’s time to polish it with Autoglym’s renowned Super Resin Polish. A famous fixture in the automotive world, this iconic polish can restore gloss to everything from the fastest race car to the humblest family vehicle. Reflecting its widespread acclaim, this product has won Detailing World’s Polish of the Year in 2011, 2012, 2013, and 2014. Beauty may be only skin deep, but the same doesn’t hold true for your car. Ensure your vehicle is as pristine on the inside as it is on the outside with Autoglym’s range of interior care products. Autoglym’s Interior Shampoo Upholstery Spray is perfect for anyone looking to get the fabric in their car clean and fresh. And don’t confine yourself to the seats, because this product can be used on nearly anything that’s made of fabric plus hard surfaces! Use it on everything from your mats and seats, to the dashboard, steering wheel, switches, and handles. If the surfaces inside your car are leather instead of fabric, you’re going to want to use Autoglym’s leather cleaning products. With the Leather Cleaner in one hand and the Leather Care Balm in the other, you can ensure that your leather interior stays clean, supple, and crack free. All the work you do polishing and shampooing your car can be for naught if you don’t have the correct accessories on hand. Thankfully, Autoglym can help you stock your workshop with everything you need to take care of all those extra little details. To ensure that your polishing job is as pristine as possible, use one of Autoglym’s polish applicators, featuring a point-and-edge design that helps you apply your polish with precision for the best possible results. And if you’ve ever have to park your car under a tree, you know the havoc birds can wreak on your paintjob. Take advantage of Autoglym’s innovative Bird Dropping Cleaning Wipes to keep your paint free of nasties. The individually wrapped wipes are a convenient solution to every driver’s most hated annoyance. In addition to these unique products, Autoglym also offer a variety of cleaning brushes, cleaning cloths, and drying towels, ensuring you always have the right tool for the job – no matter how dirty!